Two men are seen holding drinks in their hands. First man: Hello, I'm Joe. Second man, bespectacled: Hello, I'm Bob. The two men are seen shaking hands. In the next panel, the bespectacled man, still holding a drink in his hand, approaches a third man, who is also holding a drink in his hand. 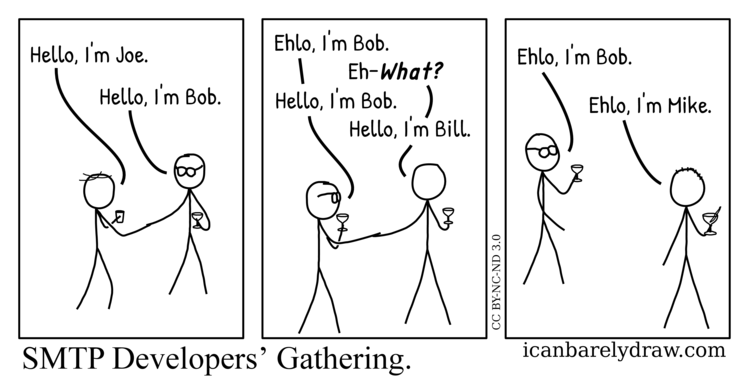 Bespectacled man: Ehlo, I'm Bob. Bespectacled man: Hello, I'm Bob. Third man: Hello, I'm Bill. The next and final panel shows the bespectacled man, still holding a drink in his hand, and a fourth man, who is also holding a drink in his hand. Fourth man: Ehlo, I'm Mike.